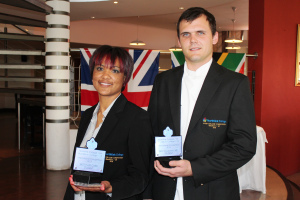 Northlink College and Blackburn Colleges (UK) locked horns for the second year in what is now called the annual Northlink College/Blackburn College international competition, that was held this year in Cape Town South Africa from 30 September to 4 October 2013. Northlink and Blackburn College, started its partnership in 2011 where the consensus was not only to exchange resources and best practices, but to continuously evaluate the standard of education from both colleges against international standards. This lead to the birth of the Inter-College competition that saw first light at Blackburn College in 2012 and the second installment took place in Cape Town South Africa. The competition saw Olivia Bastian and Brendon Gutzeit walk away with the overall award for the Hair Care and Hospitality competition. The Hair Care competition was judged in 2 categories that included a cut and up-style division while the hospitality competition was judged on a three course meal. The Inter-College competitions will be taking place in Blackburn in 2014 where another six students Northlink College students, three from hair care and three from hospitality, will be competing for the top spots.